It was an exciting session today, apart from the fact that half of the LIVE audience was my family and friends. In today’s “15-Minute Sprint”, I explained how to Inbox better and not hit the SPAM folder often and then I took it upon myself to answer questions from the LIVE audience. If these numbers are not in your favour, then improve the content in your emails or your subject line in the future emails. 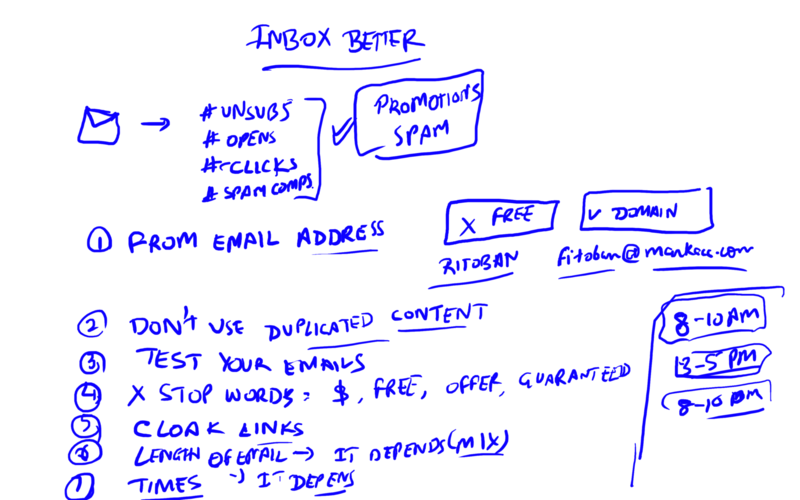 Now these are some top tips to increase your chances of hitting the inbox more often. But before we cover them, remember that you will hit the spam/promotions tab with some people. That’s just the way it is. Our goal is to try and hit the inbox as often as possible for the most number of people possible. If you’re using a FREE email address (like gmail, yahoo, hotmail) for your FROM Email Address setting in your autoresponder – just change it RIGHT NOW! This is the easiest change – so make it right now. Just register a domain name and make sure that it receives any email replies that you get. Use that email address along with your name for the “FROM Name and Email Address” combo. Treat your emails like you would your content on your blog. Mailing services keep a track of emails that are sent to users and if multiple senders are sending the same email with the same content – then they don’t like it as much and put you in the Promotions tab. The best option? Always write fresh emails. I’ve already covered this topic in my list monetization guide. There are certain STOP words that you should try and stay away from. I understand that there will be times when you will have to incorporate certain words in your email copy – and that’s fine. My recommendation is to try and use them as little as possible. While autoresponder companies have their own link cloaking in place – you should try and use a link cloaking service like IMConversion to create short links and only use those links in your emails. What’s the ideal length of emails? My suggestion is to mix it up. If you like writing ONLY short emails, try and make an effort of going out of the way and writing a long email every once in a while. And if you’re not in the mood – then write a medium length email. A lot of email marketers keep it really short with just a couple of lines and that makes the number of characters in the email too little – and that triggers the spam filters. You’re receiving this email because you opted in to our email list/newsletter because you typed in your email address into a web-form on one of our websites, or asked us to add your email address to our list. The autoresponders and email newsletters that we send you contain a variety of information related to online marketing, funnels, entrepreneurship, web design and development. Our emails are curated to provide you with up-to-date knowledge and information on tools, training, and software recommendations. Please note that in some cases, we receive compensation from our merchant partners when you make a purchase based off of our links. This does not impact your user experience in any way. We also communicate news and updates related to our products and company via this newsletter. We respect your privacy. If you want to stop these emails, simply hitting “Unsubscribe here” below or send a reply to this email and we’ll get you off the email list. It adds to length of your email, and also adds certain credibility to your emails when you tell your users you value their privacy. For more nifty tips and tricks, and to see the entire Q&A session with my LIVE stream audience, make sure you watch the video above. And then SUBSCRIBE to the Flying Start Online YouTube channel.